This has been another busy week regarding putting arrangements in place for the ‘Richborough through the Ages’ conference that will take place at Old Sessions House, Canterbury Christ Church on Saturday 25 June. To give you a taste of what looks to be a very exciting day, I’m going to run through the speakers and their topics here. In contrast to the previous fortnight, this week has been much quieter with regard to history lectures open to the public, except for Dr Martin Watts’ talk at St Peter’s Methodist Church on Thursday evening. This was organised by the Canterbury Festival as a marker that 2016 is an important anniversary for the Battle of the Somme. Martin focused to a large degree on the casualties suffered by, among other regiments, the Buffs and the West Kents, as well as drawing out the implications of the battle in terms of what was learnt by both those in high command and across society – a time of lost innocence regarding modern warfare. Others involved with the Centre have also been busy, and I thought I would report a few exciting items before offering a few snippets from the archives because I have missed being able to get on with my own research into the businesswomen of late medieval Canterbury. About this time last year I was musing about Archbishop Sudbury and the subject of commemoration, a fitting topic for the last week in December. This year I’m going to start with another murdered archbishop because today, of course, is the anniversary of Thomas Becket’s martyrdom in his own cathedral in 1170. Although I did not attend Evensong this evening when those events will have been remembered through an embellishment to the service that involves the archbishop leading the congregation to the Martyrdom, while the lay clerks continue Vespers in the quire. The events at the Martyrdom having been retold to the lay onlookers, the archbishop takes the congregation down to the crypt, where Thomas’ mangled body was similarly taken, the choir, as the monks, joining the assembled masses in the crypt for the remainder of the service. Much of this movement is undertaken by candlelight, greatly enhancing the atmosphere of this most evocative of services. Now that the Canterbury Christ Church campus is almost deserted, the students having finished last Friday and only a few stalwarts in the School still working in their offices today, it seems a good time to bring you up to date with the thinking of members within the Centre about future plans. As you might expect these are quite diverse and range from Dr Lesley Hardy’s desire to concentrate on Public History to Dr John Bulaitis’ proposal to hold a conference in 2017 on ‘Tithe through Time’, a subject that he feels has considerable merit as a means of understanding social tensions in the countryside from medieval to modern times. I believe several staff members have been out in the county giving lectures to local history groups during November. Among these are John Bulaitis at Whitstable, Lesley Hardy at Lyminge, Richard Eales at Frittenden and Martin Watts at Shepherdswell, although the latter may be speaking in early December. Such collaboration between those interested and engaged in local and regional history and those involved in this discipline within academia is a very worthwhile development and reminds me of the ‘New Directions in Local History since Hoskins’ conference that I spoke at several years ago at the University of Leicester. Even though there was at times a degree of tension between those advocating these different approaches, the resulting collection of essays underlined the ways each could benefit from the other, as the four editors demonstrated in their introduction and David Dymond discussed in his chapter: ‘Does local history have a split personality?’. 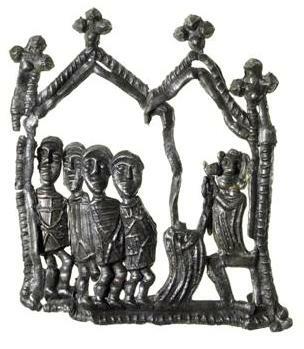 Having had a meeting today with Drs Martin Watts and John Bulaitis regarding the feasibility of putting on a one-day conference on the development of Richborough, especially its role as a gateway both into and out of Kent, and England, to/from continental Europe, I thought I would pass on the news to readers. Martin and John’s primary interest in the place rests on its 20th-century history, and both are keen to provide lectures from their recent research findings. 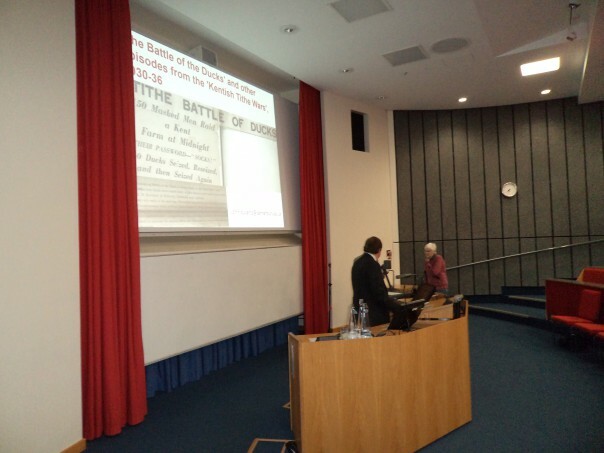 As a consequence it is envisaged at this planning stage that the talks in the afternoon will feature episodes from the port’s Great War and subsequent history, while the morning will focus on its Roman, Anglo-Saxon and medieval past. In addition to lectures from staff at Canterbury Christ Church, the intention is to involve experts from east Kent, particularly field archaeologists from the region who have first-hand knowledge of the area. More on this anon as things develop, but a provisional date for this conference is late May or early June in 2016. The lead-in to the new academic year is always a busy time, even if you are not teaching much, although it looks like I will pick-up a ‘first’ from my perspective in terms of a lecture for architecture at Kent. For those readers of the blog who live or work in Canterbury, the other thing you will have noticed is the arrival of students, and this has started already with Freshers Week at both universities in Canterbury taking place next week. From my point of view that means meeting the new Medieval and Early Modern Studies Masters postgrads at Kent, especially those who will being doing Paul Bennet and my option on ‘Medieval Canterbury’. At Christ Church this probably will mean trying to make sure all the new History students are aware of ‘The Battle of the Ducks’ lecture on Friday 2 October at 7.30pm (wine from 7pm) in Old Sessions House. Sara Wolfson, an early modern specialist, who is organising the History Induction Week, has promised to tell the students, which is great (many thanks Sara! ), and hopefully other members of staff will be doing the same. As I have mentioned before, this is the Nightingale Memorial Lecture and is a joint venture between the Centre and the Agricultural Museum Brook, which some of you may know already. John Bulaitis’ talk on the early 1930s tithe wars looks like it will be a fascinating event and is open to all, so please do feel free to come along and hear about an amazing series of episodes in the county’s history. Another 20th-century topic that is potentially going to involve people from Canterbury Christ Church and also Canterbury Archaeological Trust is a proposed project on the history of the port of Richborough. Some details are known about its history and to a degree there is a photograph archive. However more needs to be done and Martin Watts, in particular, has started delving into its documented history at the Royal Engineers, and if all really goes well a funded project may come out of this. This is only one of several leads Martin is following at the moment, as I outlined a couple of weeks ago, and more information will be reported as things progress. Keeping with this 20th century theme, I just thought people might be interested in the site on the corner of The Parade and Mercery Lane, which is now ‘Pret A Manger’, but longer-standing residents and visitors to Canterbury will remember it as Boots the chemists, before the firm relocated to its massive premises in Whitefriars. The whole history of the building is fascinating but I’ll just stick to these later times. Boots arrived in the late 1920s, taking over premises that had been those of a tobacconist (J. F. Barber & Sons), Mrs Meers’ tearoom (nothing changes although probably much more coffee than tea now) and Thomas Becket, a jeweller. 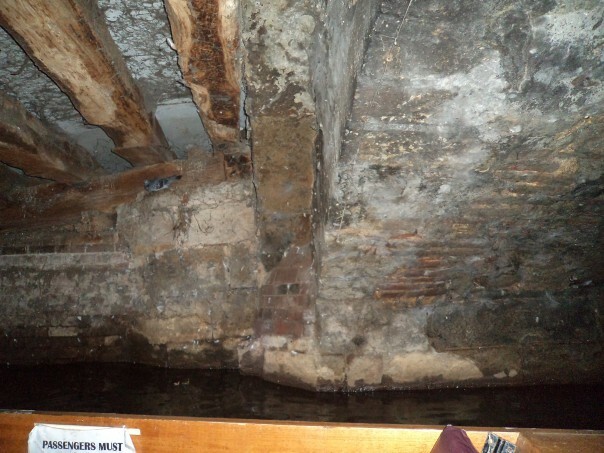 At that time the medieval building was said to be in a very poor condition and in danger of collapse, and when Boots actually came to look at it closely, it was found to be in an even worse state. Nevertheless, rather than demolish it they admirably took the decision to undertake an ambitious and costly restoration. What Boots could not have known at the time, because the scientific techniques and knowledge were then unavailable, is that some of the still existing structure pre-dates the Black Death of 1349, as discovered by Canterbury Archaeological Trust, making it a remarkable survival, albeit very little from this early phase remains. To return to Boots’ work, the firm’s own architect, Mr Percy J. Bartlett, was responsible for preparing plans which would allow the building to blend into its medieval surroundings. The main contractor was Mr George Browning, a man with extensive experience of work of this nature. Decorative plasterwork, lead work and joinery was undertaken by the Birmingham Guild Ltd. For those interested in the arts and crafts movement of the late 19th century, the Guild’s name is probably familiar because the firm had begun life in the late 1880s as the Birmingham Guild and School of Handicrafts. 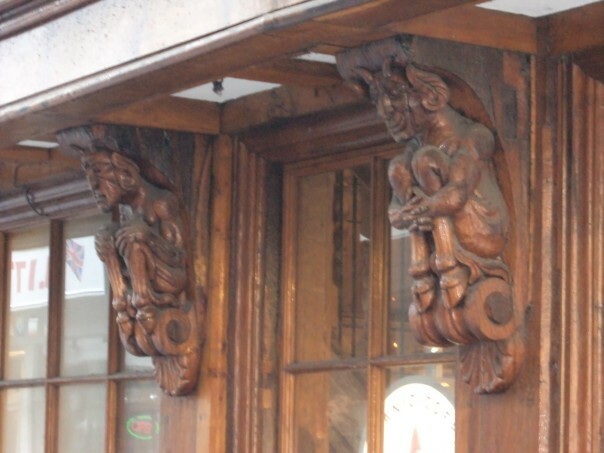 Those working for the firm in the 1880s and their successors in the 1920s were highly skilled craft workers, and their handiwork, especially the corbels in Mercery Lane, are excellent examples of this artistic craft. However, if you want a piece of genuine medieval carving turn around in Mercery Lane and look at the recently badly-damaged lion’s head on the corner of Mercery Lane and the High Street (about at adult head height). And on that note of the medieval juxtaposed to the modern I’ll finish for this week.